COVERALLS DuPont™ TYCHEM QC WITH SERGED SEAM. GDYP4. 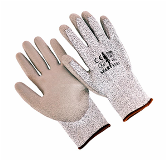 CUT RESISTANT , KNIT WRIST, GRAY POLYURETHANE PALM COATED, S-3XL. PRICE PER DOZEN. DYPU5. 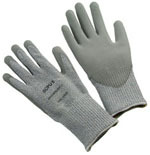 Cut Resistant Knit, Heavy weight, grey polyurethane palm coated. S-XXL. PRICE PER DOZEN. WDP3. White cut resistant knit, white PU palm coated. S-XXL. PRICE PER DOZEN. CRBN3. 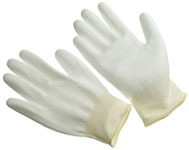 HPPE,cut resistant glove,nitrile foam coating, sizes S-2XL. PRICE PER DOZEN. Taeki cut resistant yarn, EN cut level 5, leather palm, Kevlar sewn, terry loop for heat resistant. X5. Cut resistant knit, cut level 5, PU palm coated. Price Per Dozen. SPARTACUSHV. Cut Resistant Knit, HPPE Hi-Vi green cut 5 foam nitrile glove. Price Per Dozen.